20-year-old IM Tigran Harutyunian from Armenia beat the world’s youngest GM, 13-year-old Nodirbek Abdusattorov, on the way to winning the 1st Al Ain Junior Open. 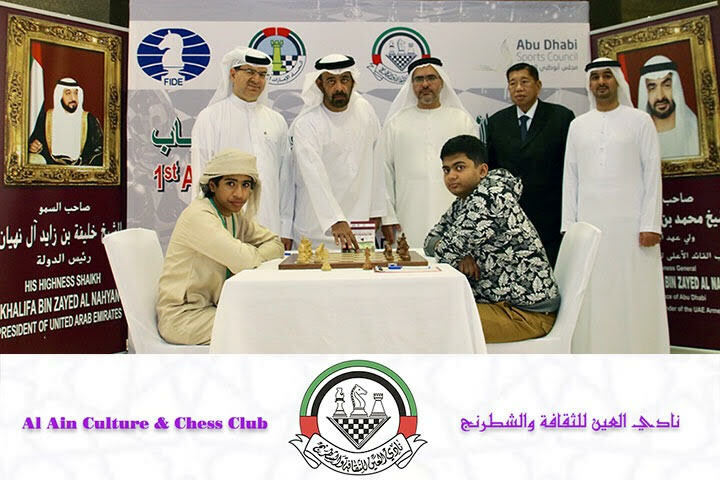 The unusual open for players 20 and under took place in the Al Ain Chess and Culture Club in the United Arab Emirates and had a prize fund of $25,000. Harutyunian also tied for first in the separate one-day blitz tournament ($3,900 up for grabs), but was edged out by 16-year-old Aryan Gholami from Iran. It’s quite common to have closed tournaments for young talents, but an open event exclusively for juniors is a rarity outside of official championships. This 9-round open ran from 30th December 2017 to 5th January 2018 in the oasis city of Al Ain and featured 143 players from 11 countries, with Armenia, India and Iran particularly well represented. The biggest star, however, was 13-year-old Nodirbek Abdusattorov from Uzbekistan, who recently met all the requirements to become the 2nd youngest grandmaster in history at 13 years, 1 month and 11 days. That was over 3 months quicker than Parimarjan Negi or Magnus Carlsen and slower only than Sergey Karjakin. His title is still pending approval, which is why he appears as an IM in our system. After 36…gxf6, though, it seems that Nodirbek rushed with 37.Bxd3, when after 37…Qxd3 38.Qxc6 Re6! Black was no worse and the game soon ended in a draw. Leaving the pawn and upping the pressure with 37.Rf1 or 37.Rad1 looks more challenging. 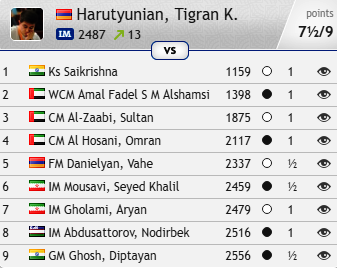 The key game of the tournament was an extremely complicated tactical skirmish in which Tigran Harutyunian inflicted the only defeat on Abdusattorov. Here Abdusattorov had nothing better than giving himself some “luft” with 25.g3, when Black was able to consolidate and make the extra material count. The critical move is 25.Qxc3?, when Black picks up a piece and is covering the a1 and d1-squares to stop back-rank mate. The problem, though, is the only move 25…Nxe4!, when the bishop can't capture as it has to cover d1, while the g5-bishop is also doomed, since the white queen has to stay on the a1-h8 diagonal. The blitz held on 4th January was open to everyone, including 23-year-old WGM Enkhtuul Altan-Ulzii from Mongolia, who took the photographs in this account but also finished the blitz in a bronze medal position with 7 wins and 2 losses. Harutyunian’s last comparable success was taking clear 1st place in the Armenian 1st League in August. That qualified him for the main section of the Armenian Men’s Championship, which starts this weekend and will determine one of the players in the Armenian team for the upcoming Olympiad.